The srcML format is an XML representation for source code, where the markup tags identify elements of the abstract syntax for the language. The srcml program is a command line application for the conversion source code to srcML, an interface for the exploration, analysis, and manipulation of source code in this form, and the conversion of srcML back to source code. The current parsing technologies supports C/C++, C#, and Java. Tools provided and custom built are used to query, extract data, and transform source code. 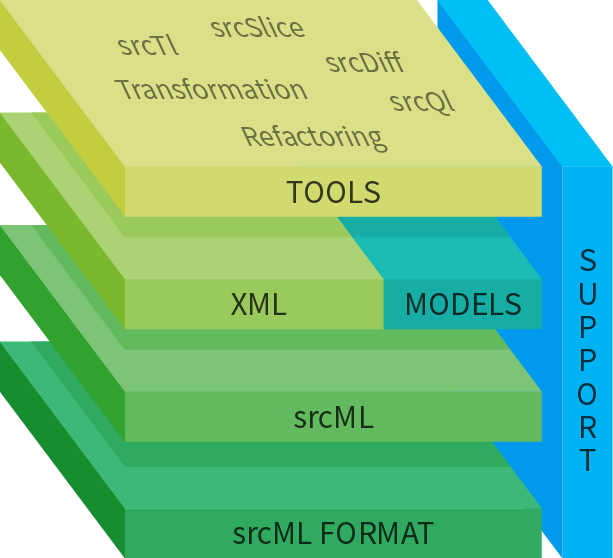 The full range of XML technologies can be applied to the srcML format. The srcml CLI is used to convert entire projects from and to source code and the srcML format. Languages supported include C, C++, Java, and C#. The srcML format represents source code with all original information intact, including whitespace, comments, and preprocessing statements. A multi-university team currently supports the infrastructure. A number of underlying features make srcML particularly useful for evolution and maintenance. The main philosophy is to take a programmer-centric view of the code rather than a compiler-centric one. First, the conversion from source code to srcML is lossless. That is, no formatting, comments, or actual code is lost. There is a round-trip equivalency from source code to srcML and back to the original source code. Additionally, macros, templates, and preprocessor statements are marked up. That is, the preprocessor is not run (or need not be run) prior to conversion to srcML. This also implies that code with missing includes, libraries, or code fragments can be converted to well-formed srcML. Lastly, the conversion to srcML is extremely efficient, running faster than a compiler. The srcml tool is used to efficiently convert source code files into the srcML format with a translation speed of 25 KLOCS/sec and approximately 3,000 files/minute. For example, the entire Linux kernel can be converted into the srcML format in less than seven minutes. This tool is robust in that it handles unpreprocessed and incomplete code. Once in srcML, XML tools and technologies can be used for such things as fact extraction and transformation. This includes the use of XPath and XQuery for fact extraction, RelaxNG and XSchema for validation, and XSLT, DOM, and SAX for transformation. The srcml tool handles the translation from srcML back to source code with speeds over 250 KLOCs/sec. srcML has been used for a variety of maintenance problems. This includes, but is not limited to, the analysis of large systems to automatically reverse engineer class and method stereotypes, supporting syntactic differencing, and applying transformations to support API and compiler migration. See the tutorials and documentation for more details on usage. Preservation of all source-code text, e.g., comments, formatting (white space), and preprocessor directives, in the original document ordering allowing full access to the source code at the lexical and documentary levels, with an equivalent forward and reverse mapping between source code and srcML. These elements are identified for further processing by development environments and program-comprehension tools. Tags for comments, preprocessor directives, statements, and other syntax allows for access to source code at the documentary, structural, and syntactic levels through XML. These levels can be addressed using XPath, e.g., /src:unit//src:while/src:condition. Round-trip transformation (i.e., source-code to srcML to source-code) can utilize XML transformation languages and tools. Opportunistic use of XML technologies: addressing with XPath, querying with XPath and XQuery, transformation with DOM, SAX, JDOM, XOM, TextReader, XSLT, and STX, and validation with schema languages DTD and RelaxNG. The srcML format is not tied to any specific XML technology and should be compatible with any XML tools and standards developed in the future. Representation and toolkit robust to source-code irregularities, e.g., uncompilable code, code fragments, single statements, and single files, with representation based on local document information only, i.e., no symbol table is used. Parser based on the concept of Island Grammars for robustness. Complete handling of encoding issues (e.g, ISO-8859-1, UTF-8). Scalable storage and translation with reasonable file sizes typically less than 4 times the size of the corresponding text file. The source code to srcML translator is a stream parser that supports event interfaces with a translation speed over 25 KLOC/sec. File and directory aware with metadata at the file level, i.e., language, file location, and version information. Multiple source-code files can be stored in one srcML Archive file, e.g., storing the entire Linux kernel in a single srcML file. The toolkit fully supports the archive format. Extensible format by adding attributes on existing elements and extending the element set. XML translation on the srcML format permits further refinement of parsing and markup. srcML is currently being supported in part by a grant from the National Science Foundation (CNS 13-05292/05217). The multi-year grant (July 2013 - June 2018) is for the enhancement and maintenance of srcML. The goal is to provide a more robust research infrastructure for the exploration, analysis, and manipulation of large scale software systems. The srcML infrastructure, including the format, parsing technology, and a select set of tools is currently open source and licensed under GPL.